What is time really? Conventional time measurements are used to calculate the natural time around us (days, years, lunar phases, etc...). Therefore human beings can plan their lives, dividing it into seconds, minutes, hours and years. 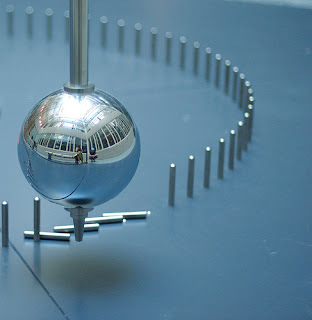 Our time perception relies in something as ephemeral as the time the Earth takes going around the sun. The perception of time is very different in any individual. Although time seems to go very slowly when we are children, it increasingly seems to go faster as we get older. This is just our own perception because the Earth spends always the same amount of time in going around the sun. Every organism, individual or element has their own vital rhythms. Geologist Asier Hilario talks about the rock formations in the beach of Flysch in Guipuzcoa, Spain. This beach is formed by a series of different rock layers which were deposited on a deep marine basin. Theses layers surfaced due to the violent crash between the Iberian and the European plates. The word “FLYSCH” was first used by the geologist Berhnard Studer in 1827. This word comes from the German “fliessen”, which means slippery. Each plate, which can go more than 300 meters into the sea, represents 10.000 years in the planet’s life. Therefore, it is possible to see a layer on the surface that corresponds to 50 million years of the Earth’s life. Important events, such as the hot and cold periods or the dinosaur’s extinction, can be clearly seen. The life of a human being would be contained in a mere 2 centimeters of these huge formations. This comparison makes us think about our position in the world and how ephemeral our existence in it is. Earth’s rhythms are not related to human rhythms at all. This happens as well with cities. Cities have been, over the millennia, living organisms that have evolved slowly, adapting to changing environment and to human needs. For the first time in history we are contemplating massive new cities starting from scratch or enormous urban developments which are two or three times the size of the initial metropolis. What once was a process evolving throughout centuries is now being made from one year to the next. At present, we are forcing the natural transformation process of cities, adapting them to our own individual rhythms. This is forcing our cities to changes in increasingly shorter spaces of time, creating integration problems and a lack of resources and facilities. We can identify today several examples around the world in which forcing the natural rhythms or trying to make habitable the inhabitable is creating important problems, mostly economical. Seseña is a paradigmatic example in Spain. 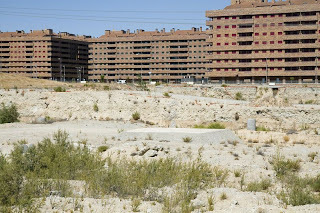 It is known as the “Ghost city” because in spite of increasing its population from 6.500 citizens in 2003 to 13.000 in 2006, 60% of the 50.000 new houses built before the Spanish bubble burst are still empty today. The lack of equipments and communications has made Seseña a very expensive city to maintain. Nevertheless, not all the cities built in inhabitable places thanks to money are located in Spain. In the USA, Miami was built over the everglades full of alligators and pitons of the Miami River. Kilometric extensions of luxury residential neighborhoods have increasingly stolen land from the natural areas. Every year the policemen and firemen corps receives progressively more calls from frightened neighbors who have discovered one of these funny animals having a bath in their pools. Nature is trying to recover what once was hers. Another curious example are the Arabic cities such as Dubai or Qatar, risen from nowhere like Seseña, but in the middle of the desert. Every year, the local authorities spend thousands of dollars trying to stop the sand of the dessert going back to the city. In this current context of financial crisis it is essential to minimize the resources consume. We need to create our cities, avoiding unnecessary waste of money. We do not have the right to speculate with our cities because they are property of humanity. We should let our cities grow and evolve following their own rhythms. As my mother told me when I was a child and I was late for school: Less haste, more hurry.